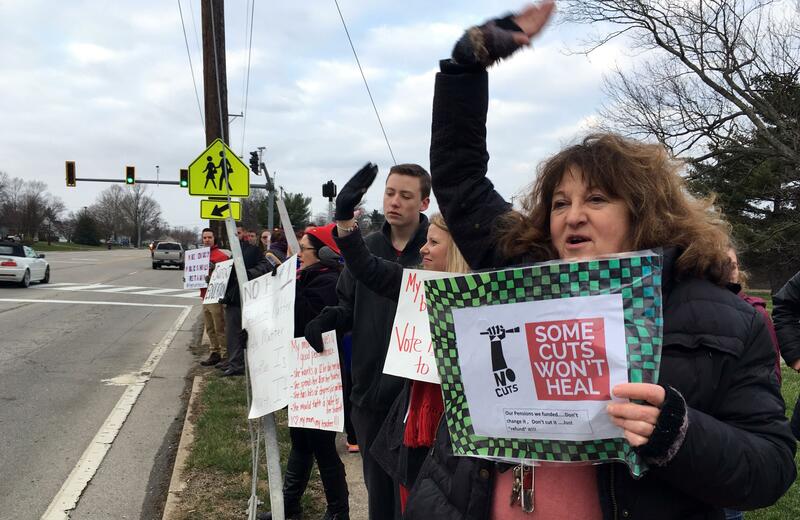 UPDATED: Thu., March 8, 2018, 8:49 a.m.
FRANKFORT, Ky. – Hundreds of teachers in central Kentucky rallied in front of public schools Thursday morning to protest proposed cuts to their retirement benefits in what could be a precursor to a statewide strike. Kentucky state Senators on Wednesday took the first step toward passing a bill they say would save taxpayers $3.2 billion over the next 20 years and stabilize one of the country’s worst-funded public pension systems. But most of those savings would come from a 33 percent cut to the annual cost-of-living raises for retired teachers, who are not eligible for Social Security benefits. Teachers have called lawmakers and packed legislative committee rooms to show their opposition. But Thursday was the first organized protest at public schools in front of parents and students. It came just days after a nine-day statewide teacher strike in West Virginia ended when lawmakers there approved 5 percent raises. Sadler was one of about 50 teachers and staff from two public schools in Kentucky’s state Capitol who stood on the side of a busy road in frigid weather to hold signs opposing Senate bill 1. Shortly after 8 a.m., the teachers held a “walk in” as they all entered school together as a show of unity. State lawmakers have taken painful steps to ensure the system is fully funded this year. Bevin’s budget proposal would put $3.3 billion in the pension system, or 15 percent of all state spending, cutting most other state agencies by more than 6 percent to pay for it. The House-approved budget proposal would raise taxes on cigarettes and impose a new tax on opioids in part to pay for rising pension costs. Wednesday, Bevin said anyone opposing pension changes are “either ill-informed or willfully blind.” He went further during a Thursday morning radio interview on WKYX, noting that no one else in state government gets an annual cost-of-living adjustment. The proposed changes would also affect school boards, requiring them to pay 2 percent of every new hire’s salary into the Kentucky Teachers’ Retirement System. It would be the first time the state’s cash-strapped districts have had to contribute to teachers’ retirement, a cost that has until now been carried 100 percent by state government. Published: March 8, 2018, 8:27 a.m. Updated: March 8, 2018, 8:49 a.m.